Outclassing the fastest under-18 sprinters in the world to win the boys’ 100m gold medal, Luke Davids is being compared to Jamaican legend Usain Bolt. ATHLETICS NEWS - Arriving in Buenos Aires earlier this month, Luke Davids was just another potential prospect among a flourishing hoard of South African sprinters. Having flaunted his speed at the Youth Olympics, however, he returned home this week as a potential star after outclassing the fastest under-18 sprinters in the world to win the boys’ 100m gold medal. “The feeling of being the fastest young man in the world and being No 1 is amazing. I’ve been dreaming of this moment for months now,” an ecstatic Davids said after stepping on the podium. “The spectators were incredible. The support they give you on the track, in the warm-up and at all times, is essential. Competing in a unique format with two rounds of competition being considered on aggregate, Davids completely dominated the 100m event. Clocking 10.56sec in round one, he finished 0.20sec ahead of his nearest opponent, Nigerian athlete Alaba Akintola. In stage two, he stormed over the line in 10.15 and though he was pushed by a +3.4m/sec tailwind, he was 0.09sec clear of Akintola, who grabbed the silver medal. While Davids went 0.05sec quicker than the national youth record of 10.20 held by Gift Leotlela, and he would have equalled the under-18 world best of 10.15 held by American athlete Anthony Schwartz, the “illegal” wind made his performance ineligible for record purposes. He nonetheless proved his immense potential once more, after setting a 100m personal best of 10.31 in Paarl in April to win the national youth title, as well as a 200m best of 20.81 at the Southern Region under-18 Championships in Boksburg a few weeks later. Coached by Nathan van Wyk, the 17-year-old Parow High School pupil was already being compared by international media to retired Jamaican legend Usain Bolt, though Davids brushed those comparisons aside. Besides, there are plenty of athletes whose legacies he can chase on home soil and he was unlikely to need to look abroad for inspiration as the latest product on a seemingly endless conveyor belt of world-class sprinters which SA has produced in recent years. While the sprint discipline had remained relatively dormant for some time, Simon Magakwe’s historic sub-10 second 100m performance in Pretoria in 2014 triggered a resurgence at domestic level. In subsequent seasons, Anaso Jobodwana earned a 200m bronze medal at the 2015 World Championships, Akani Simbine reached the 100m final at the 2016 Rio Olympics and 2017 World Championships before winning the Commonwealth Games title this year, and Wayde van Niekerk established his place as perhaps the most versatile speedster in history, shattering the 400m world record while grabbing two global titles and lifting the Olympic crown over his specialist distance. When the domestic season started in 2014, no SA men had gone under 10 seconds in the 100m and nobody had dipped under 20sec over 200m. Just five seasons later, a total of five men – Simbine (9.89), Van Niekerk (9.94), Thando Roto (9.95), Henricho Bruintjies (9.97) and Magakwe (9.98) – have run under 10 in the short sprint, and four men – Clarence Munyai (19.69), Van Niekerk (19.84), Jobodwana (19.87) and Simbine (19.95) – have gone under 20 in the half-lap event. In recent years, multiple South African sprinters have also earned medals at major international championships across all age groups, including senior level. 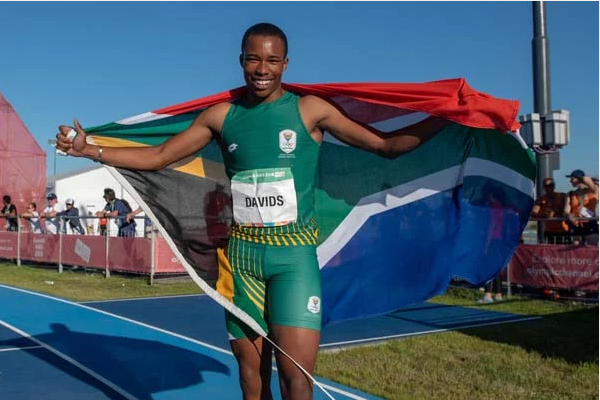 And as the latest athlete to stand up as a potential sprint star, Davids is already well moulded, with his strength and raw speed laying the platform to chase his senior compatriots and join the battle for a place in the national sprint squad, which also features powerhouse athlete Emile Erasmus and half-lap specialist Luxolo Adams. Lanky and powerful, the comparisons made between Davids and Bolt this week were by no means unrealistic, but no matter whose shadow he was chasing in the early stages of his promising career, he wanted to make a name for himself.